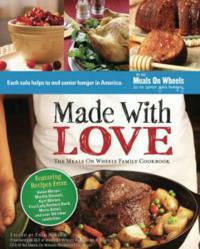 Meals on Wheels and the Honest Cooking food magazine team up to give away the celebrity filled Made with Love cookbook. Honest Cooking, the New York based digital food magazine, and Meals on Wheels, the organization focused on providing meals for more than 1 million American seniors every day, team up to give away the Made with Love cookbook. Made With Love: The Meals On Wheels Family Cookbook celebrates the importance of families' eating together through personal stories of favorite family meals and recipes from noted personalities (actors, chefs, writers, and other celebrities), as well as tips to help families come together to help others in need. The book will be illustrated with candid photos from contributors and behind-the-scenes photos of families volunteering for Meals On Wheels to help feed seniors in their communities. Contributors include Paula Deen, Helen Mirren, former First Lady Barbara Bush, Mario Batali, Martha Stewart, Kurt Warner, Dr. Maya Angelou, Joan Rivers and many others. Made With Love was released October 2, 2012 with proceeds from each sale going towards helping Meals On Wheels and its mission. For a chance to win, enter at Honest Cooking today. Or purchase your copy at Amazon.